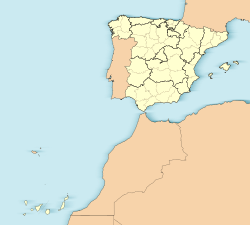 Las Palmas (/ˌlɑːs ˈpɑːməs/ or /ˌlɑːs ˈpɑːlməs/, Spaingie: [las ˈpalmas], locally: [lah ˈpalmah]), offeecially Las Palmas de Gran Canaria, is a ceety an caipital o Gran Canaria, in the Canary Islands. 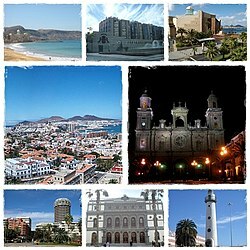 ↑ "Las Palmas Gran Canaria y Rabat, hermanadas para promover desarrollo social". Canariasahora.es. 4 December 2008. Retrieved 11 March 2011. ↑ "El Ayuntamiento de Las Palmas de Gran Canaria se hermana con Praia". Canariasahora.es. 18 December 2008. Retrieved 11 March 2011. This page wis last eeditit on 11 Mairch 2018, at 15:22.